It's that time again folks. Now I'm usually the most organised of people, but this year, something's happened to me. Only now am I getting to the end of the present-shopping for the entire family, and I've only just wrapped (pun intended!) my head around gifts for my husband. So if you're anything like me this year, you'll still be looking for gift ideas to delight the skater in your life. Read on my lovelies! First off, I should probably draw your attention to my 2010 gift ideas post. There are some solid ideas on that list, which may even be hard to beat in this post. Talk about stretching ones creativity! Just as in my 2010 guide, I'm going to break my gift list ideas down into three budgets. So here goes! I know this might sound like a practical, boring gift, but your skater (coach, skating parent, etc..) will get a lot of use out of a gift like this. You can go for either a classic flask, to carry hot tea, coffee, or cocoa, or indeed a "food flask", which has a wider neck, and usually had a hollow lid which can double as a bowl for pouring your food into. These little gems will warm you right up, whether you're in the car after a long day at the rink, or huddled in the changing rooms between training patches, who can say no to a nice cup of tea (perhaps my British-ness is coming out a bit there) to get warmed up a new? You can find these on Amazon for as little as $10. I'm sure you've seen this little do-dahs. They're everywhere during wintertime, and you can pick them up at your local drug store or supermarket for about $5. Mini hand warmers come in a variety of shapes and sizes, but usually they fit in the palm of your hand, and are round (although I recently saw some heart shaped ones, perfect if your fiancée is a skater!). They work through what's known scientifically as a exothermic reaction, that is, a chemical reaction which releases energy in the form of heat. A tiny (usually metal) disc lies within a gel in the warmer, and when you snap it, this chemical reaction starts, heating the gel which surrounds it. This gives your cold-handed skater warmth! The disc can only be used once, but you can re-use the warmer by placing it in a bowl or hot water, and some even work in the microwave (although remember that you should never put metal in a microwave!). Read the instructions to make sure you stay safe. My husband recently bought me a 2-pack of knee-high angora socks, at the cost of $10. This type of fibre is less luxurious, and thus less expensive, than cashmere, but is still impossibly soft, and warm. Tootsies which have been sandwiched in boots for hours on end deserve luscious soft socks for the ride home! You'll be able to pick these up in any reputable clothing store, or a walking/hiking shop. If you've got the budget this holiday season, you might feel like doing something extra special for the skater in your life. We've got you covered with these positively perfect ideas. Your skating person has spent all year in the cold, and deserves a little pampering of the extremities! How about a beautiful Christmas red lacquered foot for the party season, that will make them smile each time they go to slide their foot into a boot? Find a salon in your area online, or ask around about a great place to have this treat. Buy a gift card if they offer such a service, or else just pay up front before your skater pops in for her relaxation time. You will be immensely thanked for this gift! Prices vary, but you can expect to pay between $25-50 depending on the type of treatment you go for (remember not to pay for anything too "softening" for the feet - your skater has spent a lot of time, and pain, building up hardened skin on their feet to guard against boot pressure, and won't want it slain off by a pedicurist and his/her tools!). Who wouldn't want a gorgeous fleece jacket, or a thick, softly lined hoodie to traipse to-and-from the rink in? I love my Gap tracksuit bottoms, and although I don't have a hoodie from that store, am pretty sure I'd never be out of it if I did. A padded jacket is equally something no skater could resist: soft, warm, and easy to wear with any outfit, to any event. I bought mine from H&M for $25, and it comes with a super high neck that you can raise to guard yourself against the cold air, zipped pockets, and a waist band to keep you from looking like the Michelin man! You can expect to pay a bit more for brand names, but you can also find great deals on non-branded items online, for example on eBay. I know the instant anyone sees the words "sheep" and "skin" these days we all instantly think of the brand "Ugg" (they clearly have a very clever and crafty marketing team!) but the reality is they are a brand, not a product. You can buy gorgeous, non-branded, sheepskin products for a great price, and these items really will keep your skater warm during winter, and all year 'round. I bought British sheepskin slippers on eBay a few years ago, for $20, and they are just delightful! They have now worn out, but after 3 years of constant use, which for $20, I don't think is bad at all. Who wouldn't want to come home from the rink to slip on soft, uber-warm slippers? An alternative is also sheepskin insoles, which your skater can fit into any shoe! Pop these into their sneakers while leaving the rink for an instant foot-hug. You can expect to pay somewhere between $20-50 depending on what you go for. If you go branded, you're looking at $80-300 depending on what you get, and where. Feeling flash? Then spend your cash, my lovelies! Here are 3 ideas for perfect pampering of that skater! (Almost) everyone likes something with a bit of sparkle and shine, so why not indulge your skater in a piece of skating jewellery? I love this pendant from Dalia Shamir Jewellery @ Etsy.com, priced at $69. You could even commission a piece, or have a pendant engraved with a name or initials. This might not sound very gifty, but what better than to set up your skater for the rest of the reason, or the next, by splurging on some supplies you know he or she will get tons of use out of? Go all out and buy Swarovski crystals (you usually buy in packs called a "gross" which has 144 crystals inside. 10 gross, 1440 crystals, is also a popular amount) in a variety of colours for your skater to use on the next competition outfit. Add a Kandi Kane rhinestone applicator to the mix (roughly $25, I bought mine from eBay and it works a charm!) so that they're all set for turning those costumes into a vision of glamour and glitter. Luxurious fabrics also do not come cheap. Buy in a few meters of 4-way stretch velvets, or adorned glitter fabrics, and you can be sure your skater will find use for them! You can expect to pay approximately $35 per gross of rhinestones if you buy Swarovski online from distributors, and anywhere between $30-100 per meter of fabric, depending on style and adornment. Check out which events are coming your way, and buy up tickets to go see the skating sensations of the moment. You can be absolutely sure that your skater will love this gift. What could be more exciting, and inspirational, than seeing the crème de la crème of the skating scene? Depending on the type of event you choose, you can expect to pay between $50-hundreds. A professional show with stars of yesteryear will cost less than attending the World Championships. 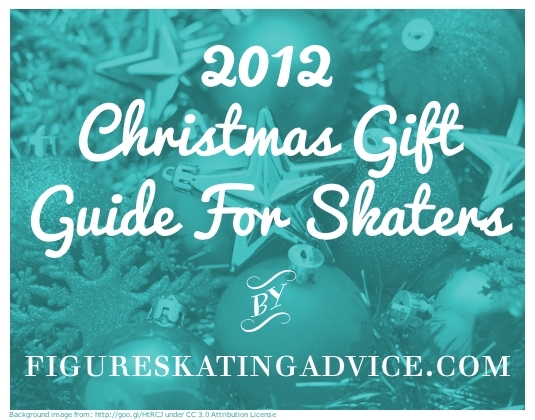 And those are my ideas for making your skater's Christmas extra shiny this year folks! Obviously there are countless ideas out there, and it's always best to get something that fits the person's personality more than their activity, but I appreciate that sometimes you have to gift for someone you don't know really well, or you may just want to offer a gift that you know will make a difference to a skating person's everyday life! Whatever you decide to gift this holiday season, make sure to do it with joy and cheer, and you can be sure that no matter your budget, the receiver's heart will be touched by the thought poured in by yourself! Has anyone found good skating posters?